I’ve tried not to post about this, but I just find it very disturbing. I understand that people need to grieve, but to have hundreds of thousands of people able to walk by and gawk at your dead body just seems like creating a sideshow out of it to me. 🙂 This whole idea of lying “in state” is so macabre. How do they get the body not to decompose over the next week? I guess they pump it full of the same crap that they feed to chickens grown in factory feed lots. The real reason they feed that stuff to the chickens? Kickbacks from the morticians union, getting us all “pre-embalmed” so they can save from having to pump us full of stuff. Everyone knows the pope was eating a diet of KFC and Twinkies. He’s good for 4 weeks at least, even in the Vatican heat! I guess Frank Perdue just finally filled himself up with that stuff! He must have had stock in McCemetery Inc., I bet his wife makes a fortune. 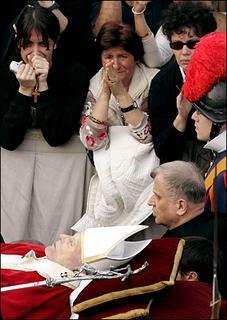 In order to clarify and avoid any misunderstanding : The guy on the picture is Jean-Paul II not me. PSX : Of course, it is not a serious comment. PS1 : No, I’m not interested to be the successor. PS2 : Ok, it was not funny.